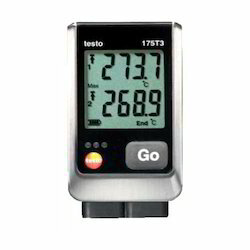 Providing you the best range of mini data logger temperature testo-174t, data logger temperature and humidity, temperature data logger, data logger temperature, data logger pressure, temperature and humidity and temperature data logger system with effective & timely delivery. 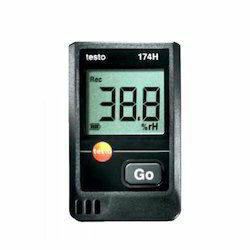 The mini data logger for temperature, testo 174T, is ideal for accompanying transports. Simply positioned close to the goods, e. g. in containers and refrigerated rooms, the data logger monitors temperature continuously, securely and unobtrusively. The free software ComSoft Basic allows fast programming of the data logger and easy analysis. The integrated NTC probe stands for high accuracy. Its large measuring range and compact design make the testo 174T the competent assistant for almost any temperature recording job. With its long-term stable humidity sensor, the testo 175 H1 is the professional data logger for the monitoring of temperature and relative humidity in work and storage rooms. The external humidity probe (stub) stands out thanks to faster reaction times in comparison to probes installed inside the housing. Energy savings are an important topic for buildings. The free ComSoft Basic software allows fastprogramming of the data logger as well as easy data analysis.The testo 175 H1 continuously records temperature and humidity values and, in addition to temperature and humidity, also shows the dewpoint in the display if required. The indoor climate is thus monitored, emphasizing the need for targeted ventilation and air exchange. The testo 175 T1 is the compact data logger for the longterm monitoring of refrigerated and deep-freeze rooms as well as for the documentation of transport temperature in delivery vehicles. The large 1 million measurement value memory and the long-life batteries allow readout at greater intervals, in spite of the shorter measurement rate. The free ComSoft Basic software allows fast programming of thedata logger and easy data analysis. 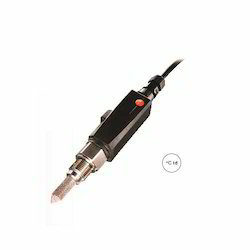 The version testo175 T2 additionally has a connection for an external NTC temperature probe for measuring the core temperature of goods. Temperature often needs to be monitored and recorded simultaneously at two sites. The testo 175 T3 is excellently suited to this job, thanks to two connections for external thermocouple probes (Type K and Type T). 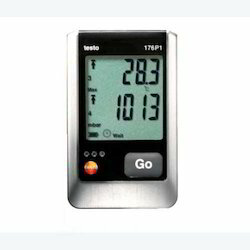 The wide measuring range makes the data logger universally applicable. The free ComSoft Basic software allows fast programming of the data logger and easy data analysis. In the autumn, the heating period begins, and with it the time for complaints by tenants that their appartments cannot be heated to the desired extent. With the testo 175 T3 and the versatile external thermocouple probes, you can, for example, perform targeted checks on the flow and return temperatures of individual radiators, in order to identify and remedy causes. When ambient conditions need to be documented extremely accurately and securely, for example in a laboratory, the testo 176 P1 is the right data logger. 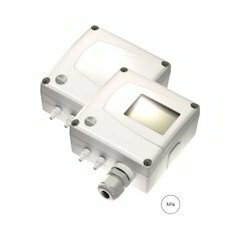 It has an internal absolute pressure sensor and connection possibilities for two external temperature/humidity probes. An integrated dewpoint calculation makes it universally applicable. The free ComSoft Basic software allows fast programming and easy data analysis. When highly accurate temperature control under extreme conditions is required, the testo 176 T1 is the right choice. 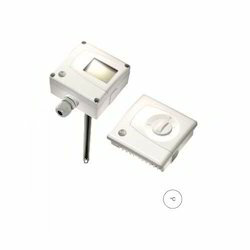 In the interior, a precise Pt100 sensor measures the temperature. 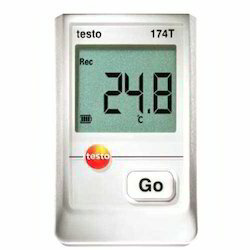 The testo 176 T1 is excellently suited to the recording of temperatures over long periods. The metal housing is resistant to extreme mechanical influences and hard impacts, making the data logger suitable for use in industrial surroundings. The free ComSoft Basic software allows fast programming of the data logger and easy data analysis. The testo 176 T2, with its two inputs for external Pt100 probes, is the right data logger for simultaneous measurement at two measurement sites. 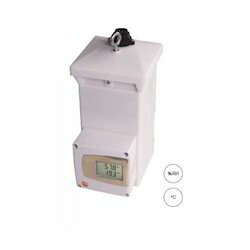 A reference class data logger which can also be used to calibrate other data loggers. Like all Testo data loggers for use in the food sector, the testo 176 T1 and testo 176 T2 are tested by the ATP testing section of the TÜV Süd according to DIN EN 12830. It is often important to check whether the prescribed temperature values in a process are really being adhered to. The testo 176 T3 in its robust metal housing is the right data logger for measuring and recording temperatures simultaneously at four different sites in industrial processes. Thanks to the broad selection of connectable thermocouple probes, the requirements of the most widely differing applications can be fulfilled. 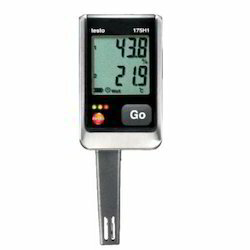 Users of the testo 176 T4 can additionally count on a clear display which provides information on measurement values and limit value violations on site. This allows the user to obtain a quick overview without having to read out the logger on a PC. The free ComSoft Basic software allows fast programming of the data logger and easy data analysis. 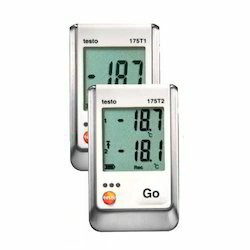 With the testo 184 data loggers, you monitor every step of your cold chain in the transport of sensitive goods by rail, in the air or on the road. testo 184 T1 and testo 184 T2 are designed as single-use loggers with a built-in battery for use over a limited period of 90 and 150 days respectively, and therefore ideal for one-way transports. At their destination, your see at a glance whether the configured limit values have been adhered to. In order to obtain detailed information, it is sufficient to connect the logger to a PC – a PDF report is immediately generated with all relevant data. 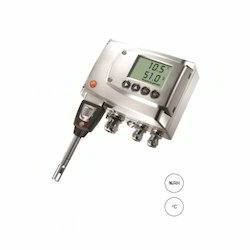 In order for you to be able to work even more efficiently and conveniently with the data loggers, all required files and information are stored directly and securely in the respective testo 184: Configuration file, calibration certificate, instruction manual and PDF report of your recorded data. We are one of the leading wholesaletraders and suppliers of Sensitive Freight Blackbox. The Base is the heart of testo Saveris and can store 40,000 measurement values. The large selection of wireless probes allows a practically unlimited versatility of application. The existing LAN structure can be used with the Ethernet probes. The Router improves wireless connection in unfavourable constructional situations. By connecting a Converter to an Ethernet socket, the signal from a wireless probe can be converted to an Ethernet signal. A differential pressure transmitter with a good price/performance ratio for applications in air conditioning and ventilation technology. Automated building services place increased demands on the exact regulation of ambient conditions. The monitoring and regulation of air filters, blowers and air flows, based on the measurement of differential pressure, guarantees security and energy efficiency. The highly accurate and long-term stable testo 6321 provides the measurement values needed to monitor and regulate differential pressure safely and efficiently in air conditioning, ventilation and cleanroom technology. 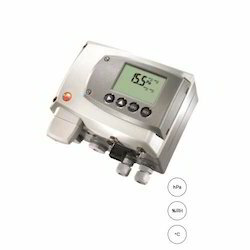 The differential pressure transmitter testo 6351 was developed specially for monitoring differential pressure in the measuring range from 50 Pa to 2000 hPa. In cleanroom technology, the maintenance of positive pressure prevents the entry of contaminated air. In addition to this, the flow velocity or the volume flow can be calculated from the measurement of the differential pressure in a Pitot tube. The testo 6351 is particularly outstanding thanks to the automatioc zero-point adjustment which ensures high accuracy and long-term stability. The compressed air counters testo 6441 to testo 6444 are designed for the measurement, monitoring and recording of compressed air consumption, and therefore also for the determination of leakages in compressed air systems, consumption-based allocation of costs and the implementation of peak load management. Using the compressed air counters testo 6441 to testo 6444, transparency of consumption is created for compressed air, similarly as for the media current, water or gas, thus increasing the motivation of those responsible for the process regarding cost reduction measures and energy savings. The compressed air counters testo 6441 to testo 6444 record norm volume flow according to the calorimetric principle, which means the measurement procedure is independent of the process pressure and does not cause a permanent pressure drop. While the thermal, glass-coated ceramic sensor offers a high level of robustness and fast response times, the integrated inflow and outflow pipes ensure optimum accuracy. 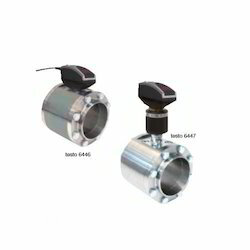 The compressed air counters testo 6441 to testo 6444 are designed for the measurement, monitoring and recording of compressed air consumption, and therefore also for the determination of leakages in compressed air systems, consumption-based allocation of costs and the implementation of peak load management. The compressed air counters testo 6441 to testo 6444 record norm volume flow according to the calorimetric principle, which means the measurement procedure is independent of the process pressure and does not cause a permanent pressure drop. The version testo 6447 offers everything the testo 6446 provides, in addition the removal of the probe under pressure is possible (patented screw fitting). The larger nominal values refer especially to important compressed air pipelines, often the main supply line after preparation. Not all measurement problems can be solved with "simple" transmitters. The testo 6651 meets special challenges. When combined with the probe series testo 660x, the testo 6651 becomes the first choice in demanding air conditioning technology as well as in many other applications. Industrial humidity measurement demands absolute professionalism. Not only in running the system, but also in the measuring technology used. The industrial humidity transmitter testo 6681, combined with the probe series testo 661x fulfils these high demands. The testo 6681 has a number of additional features, above and beyond the properties and benefits of a conventional transmitter, which will delight practitioners. This and other reasons make the testo 6681 the first choice in drying technology, trace humidity and compressed air process technology, as well as in demanding air conditioning technology, e.g. in cleanrooms. 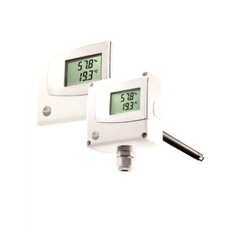 The testo 6721 is a low-budget dewpoint guard with two switch contacts for controlling and monitoring refrigeration and adsorption dryers. The continuous monitoring and control of compressed air dryers was up to now often not economically viable. The testo 6721 closes this gap. Whether integrated as a component in the dryer or pneumatic machine, or installed by the customer. With this compact solution, you increase the efficiency of your dryer. At the same time, you avoid follow-on damage to systems and products caused by excessive humidity in the compressed air. The testo 6740 was especilally developed for trace humidity measurement in compressed or dry air (e. g. granulate dryers). Thanks to a special adjustment, optimum accuracy in the trace humidity range has been achieved. The result of the development of the testo 6740 is a measuring range of -60 °Ctd to 30 °Ctd and excellent accuracy. 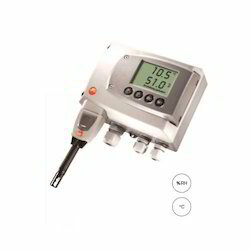 The testo 6920 is a cost-effective temperature transmitter that is appealing thanks to its functionality and design. If desired, it can be equipped with a display and/or an interface for adjustment. 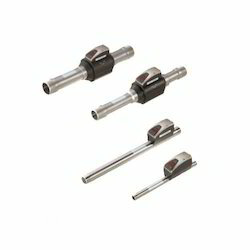 A set-point adjuster is available as an option for set-point setting. If equipped with an interface, the transmitter can be calibrated/adjusted using the P2A software. 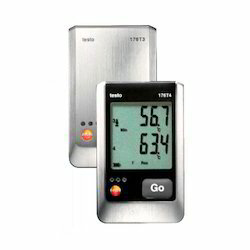 The testo 6920 transmitter is available as a wall and a duct version. 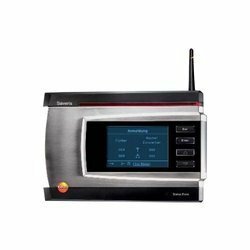 The WiFi data logger system testo Saveris 2 is the modern solution for the monitoring of storage and work rooms. The system consists of WiFi data loggers and a Cloud data store. 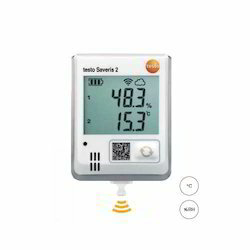 The testo Saveris 2 WiFi data loggers reliably record temperature and humidity at defined intervals, and transmit the measurement values directly by WiFi to the Testo Cloud. The measurement values stored in the Cloud can be evaluated anywhere and any time using an internet-capable Smartphone, tablet or PC. Limit value violations are immediately reported by e-mail or optionally by SMS. The data loggers store up to 10000 measurement values per channel. 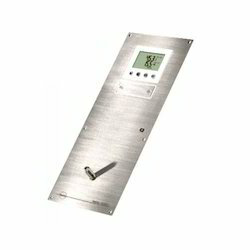 The display provides information on current measurement values, defined limit values, limit value violations, min./max. values and the remaining battery life. The batteries have a lifetime of 24 months and can be exchanged by the user. 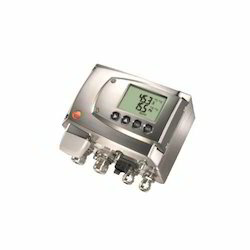 The differential pressure transmitter testo 6381 was developed specially for monitoring differential pressure in the measuring range from 10 Pa to 1000 hPa. In cleanroom technology, the maintenance of positive pressure prevents the entry of contaminated air. In addition to this, the flow velocity or the volume flow can be calculated from the measurement of the differential pressure in a Pitot tube. Thanks to an optional probe from the probe series 6610, the additional recording of humidity and temperature with one instrument is also possible. The testo 6381 is particularly outstanding thanks to the automatioc zero-point adjustment which ensures high accuracy and long-term stability.The integrated self-monitoring and early warning function also guarantees the operator high system availability. The differential pressure transmitter testo 6383 was developed specially for monitoring low differential pressures in the measuring range from 10 Pa to 10 hPa. In cleanroom technology, the maintenance of positive pressure prevents the entry of contaminated air in critical zones. Thanks to an optional internal or external probe from the probe series 6610, the additional recording of humidity and temperature with one instrument is also possible. 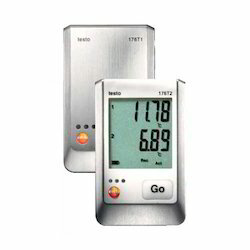 A broad variety of the testo 6621 transmitter is available. Depending on the application in a room or in a duct, the corresponding designs can be selected. A display and an external probe are available as options. You can choose between the housing colours grey and white. The testo 6621 is persuasive in technical terms thanks to the patented humidity sensors that guarantee the highest accuracy. The sensors and the analog outputs can be adjusted, analyzed and parameterized via the external interface using the P2A software. 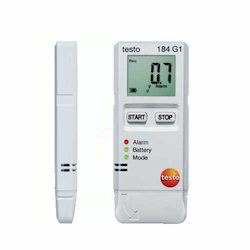 The testo 6621 is a high-performance transmitter for a low price. It meets the increasing requirements in automated building services in terms of accuracy, reliability and safety and thereby saves energy costs. The testo 6631 transmitter was developed specially for monitoring critical ambient conditions in greenhouses, e.g. for bio research purposes. Precise and reliable humidity measurement is indispensible in these applications, in order to avoid costs caused by failed experiments. Process security and system availability, among the most important factors in experimental plants, are supported by a number of properties of the testo 6631 bio research transmitter. The mini data logger for temperature and humidity testo 174H is ideal for monitoring temperature- and humiditysensitive goods in storage. 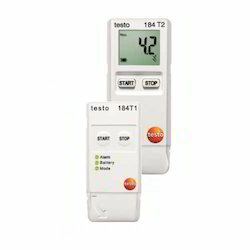 The testo 174H also monitors building climate continuously, securely and unobtrusively. The free software ComSoft Basic allows fast programming of the data logger and easy analysis. The low-cost temperature and humidity data logger guarantees secure measurement results on the basis of state-of-the-art measurement technology. 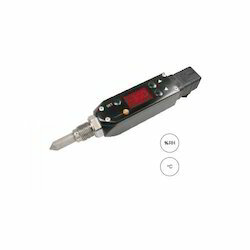 The integrated sensors ensure long-term stable measurement values. This allows you to adhere to and safely document quality assurance guidelines. Looking for Measuring Systems ?